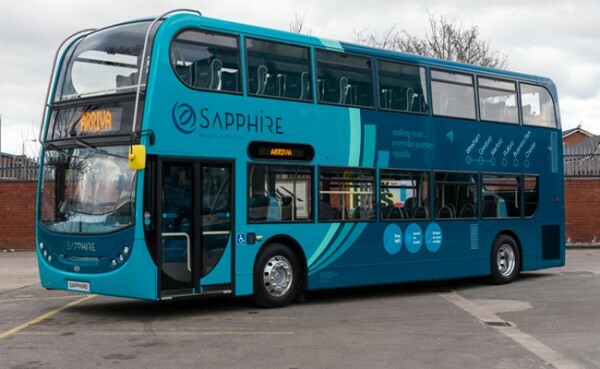 Arriva UK Bus is launching a new premium service, Sapphire, aimed at reinvigorating bus usage on key routes in four locations across the UK. Arriva has invested more than £3million as it looks to the premium service to grow passenger numbers on core routes. Sapphire has been designed to primarily attract non-users but also increase the number of journeys taken by infrequent and semi-frequent users. The new concept was developed following extensive customer research including surveys, site visits and focus groups. The research highlighted a number of core customer requirements and the opportunity to improve perceptions of the bus, change the behaviour of non-users and encourage existing users to make more journeys. A customer charter with a no-quibble money back guarantee. The Sapphire launches will see 41 vehicles across four routes, a mixture of new and refurbished, create a service focused on enhancing the customer experience, through features such as leather seating and free WiFi. “We’ve deliberately selected key routes on our network that offer a potentially longer journey time, so that customers have more time to take advantage of the free WiFi, or to simply enjoy sitting on comfy leather seats! The first Sapphire buses will be delivered in April 2013 in the North West. They will then be rolled out to three other routes, ensuring that there is a Sapphire route in each of Arriva UK Bus’ regional businesses. Each is an inter-urban route that offers a long enough journey time for customers to appreciate the added benefits of Sapphire.